[et_pb_section admin_label="section"][et_pb_row admin_label="row"][et_pb_column type="4_4"][et_pb_text admin_label="Text" background_layout="light" text_orientation="left" use_border_color="off" border_color="#ffffff" border_style="solid"] Hey you guys! I'm writing this blog post from my brand new, custom-built desk! WOO HOO! But let's back up a second...I've been working on redoing my office as a guest participant in the One Room Challenge. In case you haven't been following along, the One Room Challenge is a blogging event put on by Linda at Calling at Home. 20 featured bloggers and a bunch of guest participants take 6 weeks to update or renovate one room, and everyone posts their progress along the way. This is week 5, which of course means that this is the last progress post before the big reveal! It's really hard for me to be patient and wait to show you all the cool things that are happening in here. I mean, I'm the sort of person that gives gifts as soon as they come in the mail because I can't wait to give them to people! But I'm going to be strong and wait to reveal it all next week. There is still PLENTY of progress to show off for this week. Really, this post should be titled "an ode to my incredibly patient, hardworking, handy parents". They worked SO HARD to help me achieve my vision and I couldn't be more thankful, because I LOVE how the biggest projects in the room turned out. So that beautiful shot up there is what my "office" looked like pre-parents. I'd made a lot of progress on the other side of the room, but this side was waiting for the big stuff to come in, and was an utter disaster right up until that day. Andy I got everything cleared out of the room in time for my parents and the family dog Trooper showed up, and they got right to work getting the pre-built portions of the built-ins in to the house. Now let's be clear about something - this is not a how to post. You know why? Because I don't know how-to do any of this stuff. I mean yeah - I can use saws and drills and stuff and am not some damsel in distress, but this is actual carpentry, so I let the more competent non-professionals handle it. First my mom got to work on removing baseboards while my dad and Andy brought in the cabinet bases. We used standard base cabinets from Home Depot because cabinets are really hard to do well, and my dad has a full-time job that doesn't involve being my personal carpenter (bummer. I know.). However, my dad made custom wood countertops for the cabinets, and for the center desk area. Here he is perfecting one of the countertop pieces. We attached the countertops to the cabinets, and the cabinets securely to the wall. And again - I'm using we loosely here. I ran around and grabbed tools and held stuff, my parents did all the work, and Andy held Trooper because the noise of saws and tools and movement kinda scared the pour little guy. I mean.. just look at all the love in this picture. Once the shelving was up and attached, it was time for the header board and crown molding. My dad said this was the part he was most nervous about, but he and my handled all the angles and awkward attaching like pros. I think the crown molding really makes the look! 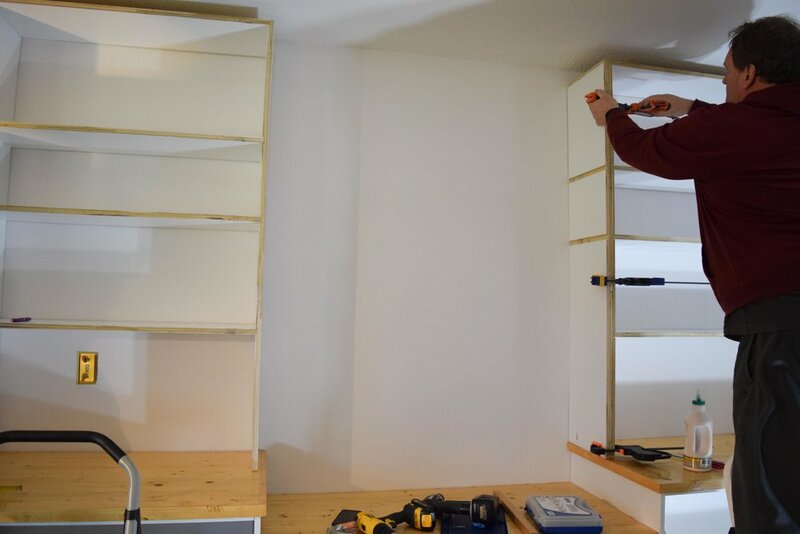 I wanted to put some decorative trim on the front of the shelves and the upright supports to give the unit a little character, and this was a pretty slick process too. I don't think we ever even had to re-cut a piece of trim! I feel like I made this whole process sound easy, which isn't really fair. This was a pretty solid day's worth of work to install all of it, but I don't think my parents could have made it any easier on themselves. SERIOUSLY! How good do these look?! I'm still in awe of everything that went down here last weekend. My dad also built an awesome desk/work table that matches the countertops, but I think you'll have to tune in to the reveal to check that out. Now it's my favorite part! Pulling together all of my random thrift store finds and pretty objects (and maybe a few actual books - HA) and styling out the shelves, desk, and the rest of the room. It's a lot of space to fill, and I don't think I'm capable of minimalism. Anyway.. there will be lots of good stuff in the reveal! I'm so thrilled to a beautiful, functional space to do some work in. WEEK 6 REVEAL HERE I COME! Newer PostOne Room Challenge: The Office | Week 6 - The Reveal!